Hillyard is a busy place, thanks in no small part to the presence of the USS-POSCO steel mill. Several times each day, trains loaded with 25-ton steel coils make their way to or from the plant, using all forms of motive power. We have spotted a number of oddball units here, including those belonging to Norfolk Southern, Kansas City Southern and Illinois Central, among others. Other products are also interchanged here, including a number of chemicals used in steel production. With so much activity at all hours of the day, it is no surprise that problems do occasionally occur. Hillyard has been the site of several derailments, most of them minor. BNSF crews performed a major maintenance blitz in this area during spring 1999, following the derailment of two propane cars near the steel mill. If you wish to see Hillyard, your best bet is to take Harbor Street north from Highway 4. Turn right on Santa Fe Avenue, just before the second railroad overcrossing, and there you are. This is not the best area of town and good photo angles are difficult to come by. Use caution on your visit. 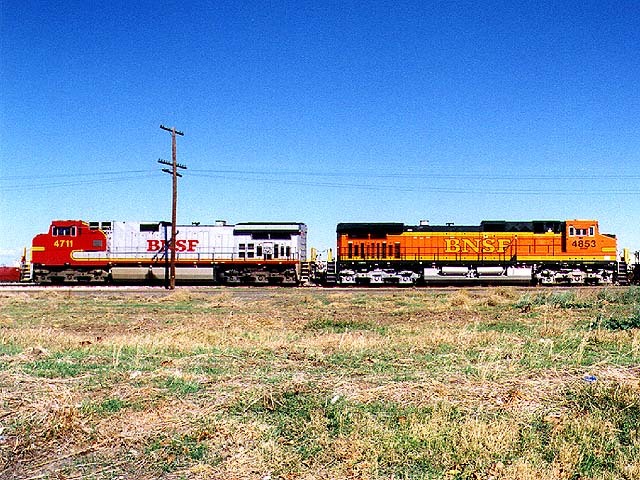 A pair of BNSF Dash-9s wait at the edge of the yard after depositing their load of cars at Hillyard in November 1998. 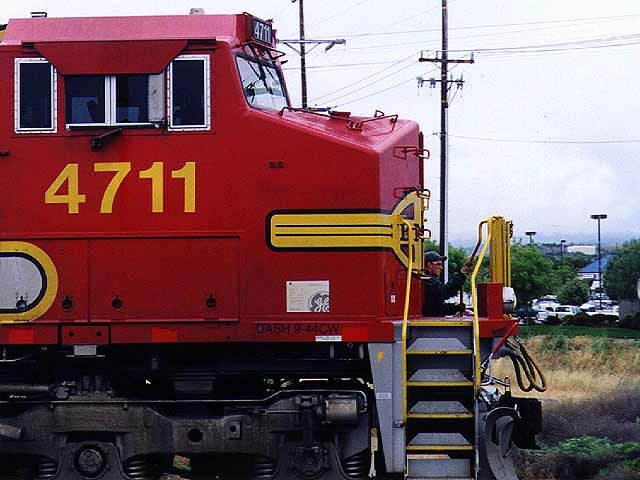 The BNSF 4711 seems to follow us around; we have seen this unit on many occasions in several locations. Photo by Roni Gehlke. Yes, this is the same photo as #1, but we have eliminated the line pole and given it a postcard presentation. Photo by Roni Gehlke. Hillyard is a good place to spot oddball equipment. 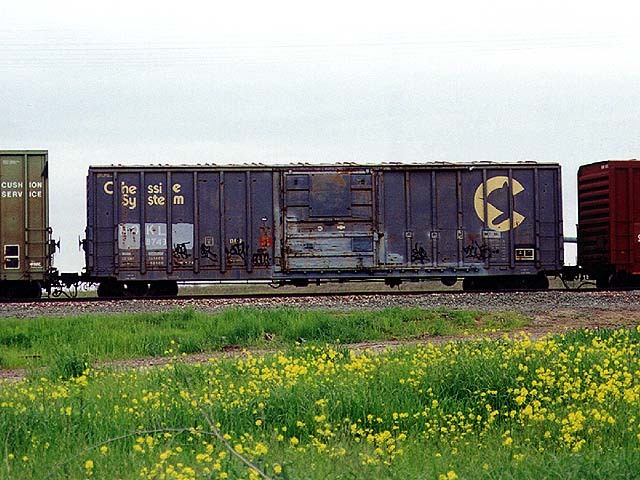 Here we have a former Chessie System boxcar still wearing its kitten logo and original paint, although it now works in paper service for an independent carrier. It is March 1999 and the wild mustard is in full bloom. Photo by Roni Gehlke. Surprises are what make a day by the tracks fun. 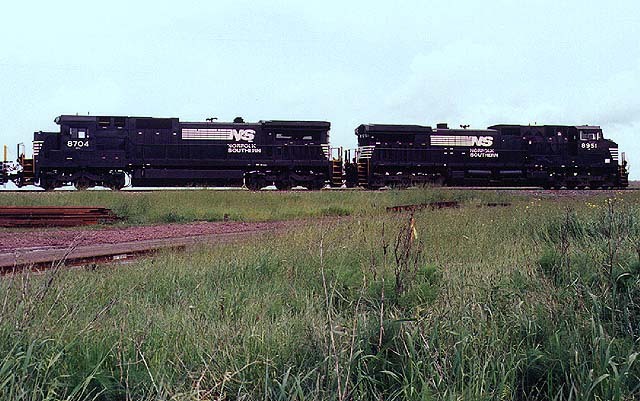 We got a big one on April 8, 1999, when we spotted a pair of Norfolk Southern units on a train heading west through Oakley. We hopped in the car and caught up with them at Hillyard, strapped up behind a brand new BNSF super pumpkin. Photo by Roni Gehlke. 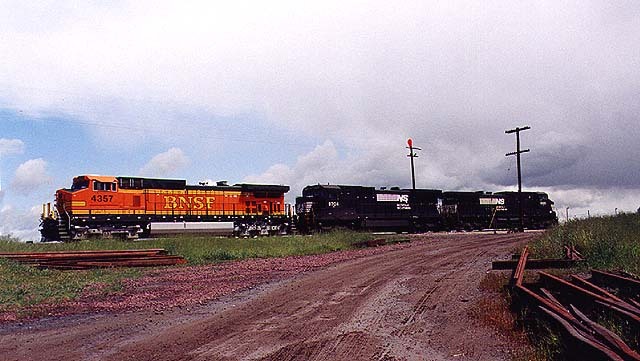 Here they are -- the NS 8704 and NS 8951, looking virtually at home on their foreign road. We have spottend many Norfolk Southern units roaming California rails, although their presence here is still considered a rarity. To see two in the same train is nearly unheard of. Photo by Roni Gehlke. This page was last updated Tuesday, August 3, 1999 at 22:30 hrs.